Never have I ever wanted to faceplant into a pile of meat. Until now. A ribs girl, that’s what I can call myself? I want to be a summer cliché and grill ribs every weekend. Can we do that? Let’s do that. Previously, ribs sort of fell into that category of things that require lots of work to for little return. You know? Like chicken wings? Like crab legs? All delicious, but so much work for just a few bites? But now. Gah. I can hardly take how in love I am with these baby back ribs. I did a bake-then-grill method with the ribs blanketed in spices and finished off with BBQ sauce. 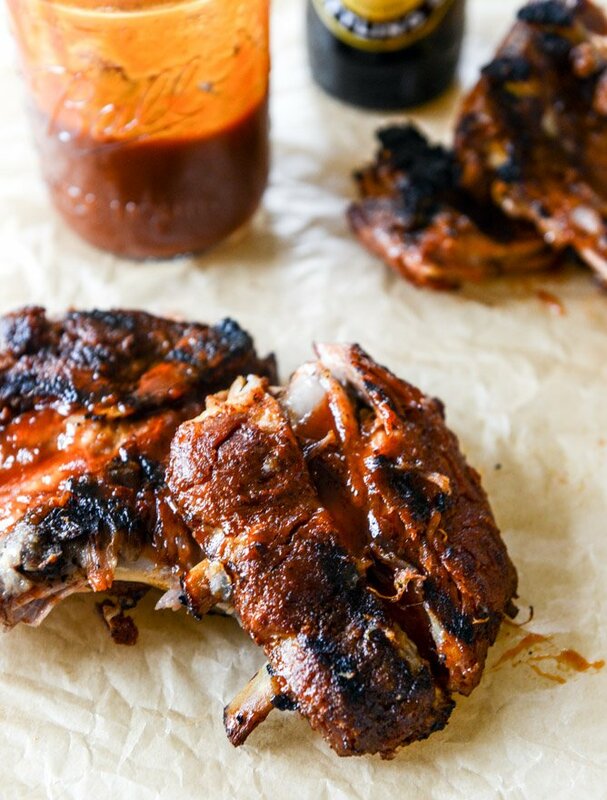 And not just any BBQ sauce, but a root beer BBQ sauce based on the vanilla bourbon version in my cookbook. It’s dreamy. I crave it. It’s stockpiled in my fridge right this very minute. The end result was fall-apart, super tender meat – but complete with charred crispy bits on the outside from the grill. This was TO DIE FOR. It was also so so so much easier than I anticipated. I’ve been intimidated by ribs before – I’ve made them a few times and they’ve come out tougher than I’d like. This method is no fail. The ribs are so juicy after baking that they almost fall apart on the grill, so the only thing you must do is work fairly quickly. Eddie was afraid that the sauce would taste TOO much like root beer, but alas. It’s delicious! It’s smoky and sweet and only slightly root beery. We miiiight have stood over the baking sheet of ribs and went to town, way before even sitting down for dinner. Like a cookie binge, but with ribs. Do you get me? Throw this on your Father’s Day menu, maybe with some perfect pasta salad (if you follow me on snapchat, you might have seen that over the weekend I made a bacon bleu pasta salad with grilled corn, tomatoes and tons of fresh herbs… omg) or even a grilled romaine salad. You can do chocolate cake or shandy floats for dessert – how super fun! Can’t go wrong with a burger and you should probbbbbably make a cherry pie with amaretto cream. Can you tell why I’m the absolute worst at giving menu suggestions? What are you making? Just make all the things. All the time. Preheat the oven to 300 degrees F. Place each rack of ribs on a doubled sheet of aluminum foil. In a bowl, whisk together the salt, paprika, mustard, garlic powder, pepper, onion powder and chipotle chili powder. Rub the mixture all over both sides of the ribs, then wrap the ribs up in the aluminum foil. Place the racks on a baking sheet and put them on the center rack in the oven. Bake for 2 1/2 hours. After 2 1/2 hours, gently pour the juice in the foil packets into a large bowl or measuring cup. Whisk in 3 to 4 tablespoons of BBQ sauce. Heat the grill to the highest setting and remove the ribs from the foil. 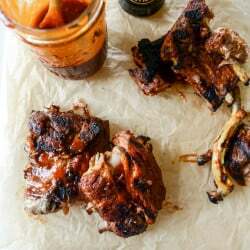 Once the grill is hot, place the ribs on the grill and cook for 10 to 12 minutes, until they are charred and slightly crisp on the outsides, basting and rubbing the juices/BBQ sauce mixture on top. Let cool slightly before serving with lots of BBQ sauce. Place all ingredients in a saucepan and whisk together until combined. Heat oven medium heat and bring to a boil, then reduce to low heat and cook for 30 to 60 minutes, until thickened. Stir occasionally. Remove from the heat and let sit at room temperature until it cools and thickens even more. This looks amazing, I can’t wait to make it. Thanks for sharing. Made these again tonight and just had to come back and comment – again – how good they are! This is now my go-to rib recipe. The rub is the perfect combination of smoky, spicy, and savory. This time, we paired them with new BBQ sauce we just bought (chipotle BBQ, yum!) 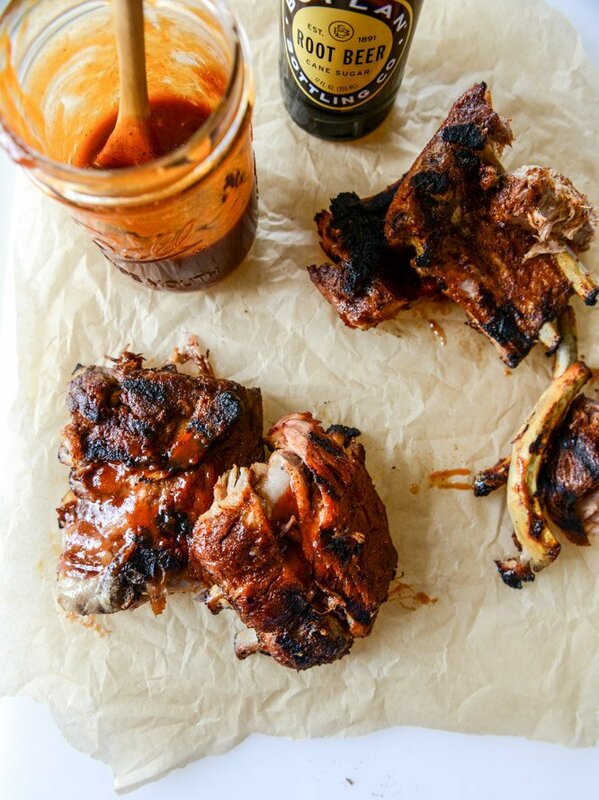 and it was great, but we loved the root beer BBQ sauce from this recipe, too. Five stars! Eating them with what is probably the unhealthiest (read: tastiest) mac and cheese ever – Million Dollar Macaroni and Cheese Casserole from Carlsbad Cravings. My tummy is happy! I love root beer, and I definitely love ribs. I noticed a few different spices there that are quite spicy, where-as root beer can definitely have that bitter/spicy after-taste. I’ll definitely have to give this recipe a go.